GM Diet day 0 is a day just before the start of GM diet week. GM Diet is an aggressive diet plan and claims to reduce about 4.5 - 7.5 Kgs (10-17 Lbs) in a week's time. GM Diet is an aggressive diet plan and claims to reduce about 4.5 – 7.5 Kgs (10-17 Lbs) in a week’s time. Is it true? Yes, may be, may be not? I will try to answer all these questions when i will be done with testing this diet plan. GM Diet is primarily based on extensive use of Fruits and vegetables. I am not sure about the authentication of this diet’s relation with the General motors, but sounds like this one is quite famous and people are too keen to try it. 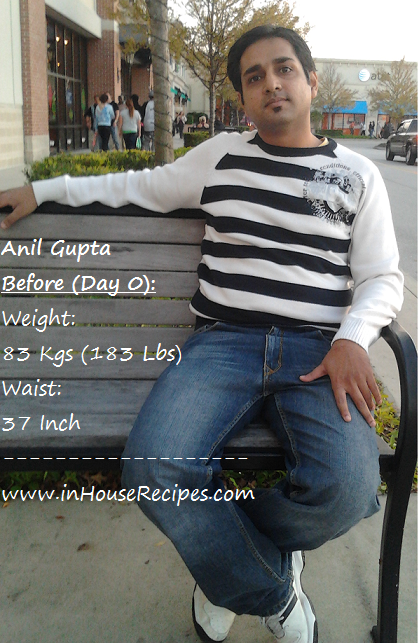 I am no different and here I am (Anil Gupta) trying to test the diet plan and hoping to reduce the claimed weight! Also, This is not the first time that I am trying to lose weight. I was successfully able to lose about 4.5 Kgs earlier in about 1.5 months without exercising. At that time, I did not follow GM diet but ate only high protein items. I was able to simply avoid sugar (sweets and other desi mouth watering delicacies) as I was on an assignment abroad where Indian sweets were not easily available. But this time, I am trying to loose same amount of weight in a much lesser span of time. The GM diet plan talks about eating Beef during the program on Day 5 as noted on many sites on internet. I am a non-vegetarian but will be following a Vegetarian version. Be with me to see how things turn up in next 7 days. I will share all my details and eating behavior with you here. Please note that Day 0 is NOT the first day of GM diet. It is the day just before the diet start day. GM Diet Day 0. Preparing for the diet week…not really. I tried to control but ended up stocking a lot just before starting on the mission. 4 Slices of bread (roasted with Oil on Tawa). 1 Large Cup (Our 1 Cup = 240 ML) of Tea. 1 medium size bowl of butter chicken. 2 Gobi Paratha with 1 bowl rice. So, after having a good Sunday outing with good food, I am going on a GM diet from tomorrow. I will be adding my food details and observations tomorrow. Keep watching.